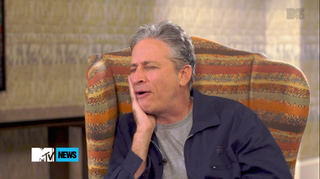 In a generally dry interview with MTV, Jon Stewart talks about failing to keep up with pop culture and then, spontaneously, decides to show off his best Taylor Swift karaoke skills. At the 1:13 in the clip, Stewart starts singing: "It's a teardrop on my guitar/ And something's happened, gonna eat a chocolate bar." I don't think those are the real lyrics to "Teardrops On My Guitar," but they could be. You may ask: Why Taylor Swift? You may also ask: Why not Taylor Swift? "It's who I am. I've had some tough relationships," he says. "It's important to have somebody who knows how it feels to be alone." Yes, Jon. Yes, it is.